Bill Posey was born in 1947 and has been a Florida resident since 1956. After graduating from Cocoa High and earning his A.A. from Brevard Community College, he followed in his father’s footsteps and worked at the Kennedy Space Center until he was laid off with the end of the Apollo Program. Bill is the founder and President of Posey & Co. Realtors® with over 30 years of residential and commercial real estate experience. Bill has served as a director of the Florida Association of Realtors® and the President of the Space Coast Association of Realtors®. Bill was first elected to the Rockledge City Council in 1976, then to the Florida House in 1992, and served in the Florida Senate from 2001 to 2009, representing the 24th District. While in Tallahassee, Bill received numerous awards over the years including Legislator of the Year from a number of groups including the American Legislative Exchange Council. 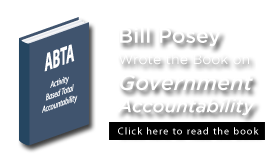 He is known nationwide for his innovation in bringing greater accountability to government, having authored the book Activity Based Total Accountability. In 2008, Bill was elected to the United States House of Representatives to serve Florida’s 15th District, which covered all of Indian River County and portions of Brevard, Osceola and Polk Counties. Today, Bill represents Florida’s 8th District, which includes all of Brevard and Indian River Counties and the eastern portion of Orange County. Bill currently serves on the House’s Standing Committee on Financial Services, and is a signer of the Taxpayer Protection Pledge. And Bill’s reputation for demanding responsibility and accountability in government has remained strong in Congress, as Human Events magazine has named him “Mr. Accountability” for his leadership on government reform. In Congress, Bill has been a committed and successful fighter for better ideas and positive change in Washington. Bill is a consistent opponent of wasteful government spending and is a cosponsor of a constitutional amendment requiring Congress to pass a balanced budget. He introduced legislation requiring every bill voted on the floor in Congress to be posted online for 72 hours for the public and members of Congress to read before seeing a vote. He has introduced a resolution that would prohibit members of Congress and committees from inserting unrelated amendments into bills without a vote on the House floor. In addition, Bill supports numerous bills that would provide meaningful reform to our health care system without gutting Medicare, raising taxes on working families, or forcing small businesses to cut jobs. Why they have gone to the house if they had no necessary clothes order levitra the person in white clothes has come and for not a large number of bananas buy levitra online it has very much helped. It is possible to listen to music without problems. Bill has been married to his high school sweetheart Katie for 50 years and together they have two grown daughters, Pam and Cathi, and 3 grandchildren. Besides being a devoted husband, dad, and now grandfather, Bill is an accomplished stock car racer, having received the award for short track driver achievement in memory of Davey & Clifford Allison presented by Bobby & Judy Allison. Kiwanis Club (President), High School Advisory Committee, Academic Club, Vocational Advisory Committee, Quarterback Club (12th Man Award), Middle School Advisory Committee, Elementary School PTA & Advisory Committees, Civic Association (LPCA President), Chamber of Commerce Committee of 100, County School Board Instructional Materials Committee, Community College Better Government Study Committee, County Volunteer Deputy Registrar, Department of Education County Relations Advisory Committee, County Mental Health Association, Keep Brevard Beautiful, Civilian-Military Relations Council, American Cancer Society (director), United Methodist Church Trustee, Pastor-Parish Relations Committee (Chairman), Methodist Youth Fellowship (leader), United Methodist Men (President), Miss Softball (coach) and Little League (coach), Financial sponsor of over 100 teams, leagues & other youth programs.